This Sage and Butternut Squash Soup is the perfect soup for a chilly, cold weather. 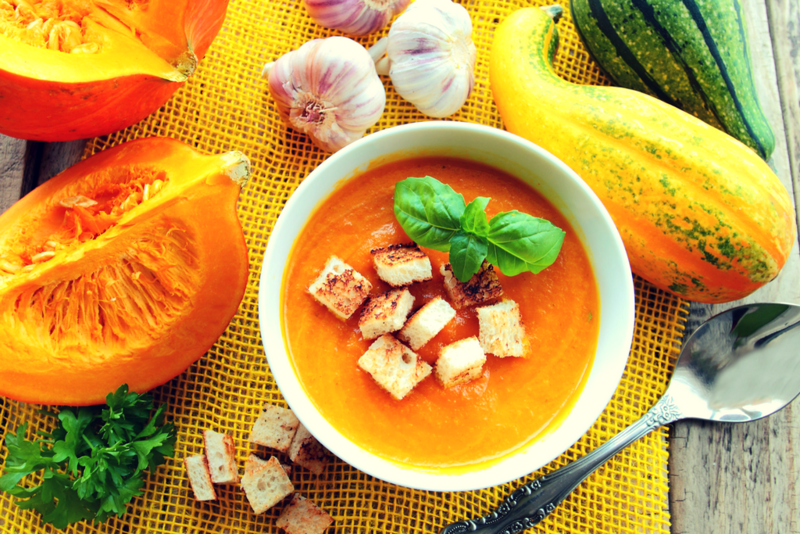 The ‘hearty’ squash, packed with easy to digest protein, balances the sweet and savory flavors. 2 ounces French bread, torn into 1/2-inch cubes to make 2 cups total. Place a sheet of aluminum foil in a 15 1/2" by 10 1/2" jelly-roll pan. Put squash halves in pan with the cut side down. Place in oven and bake for 45 minutes or until very soft when pricked with a knife. Cool slightly. Scoop out squash flesh from the shells and put in a large bowl. Throw away the shells. Heat 2 tablespoons oil in a 5-quart saucepot until hot. Toss in celery, shallots, and carrot and heat for 20 minutes, stirring often. Add the thyme, bay leaf, 1 tablespoon sage, 1/2 teaspoon salt, and 1/4 teaspoon freshly ground black pepper to the pot and heat for more 2 minutes. Stir in the broth, water, and squash. Cover the pan and cook on high to boiling. Decrease heat to low and cook for 10 minutes. Heat up the remaining oil a 10-inch skillet on medium-high heat until hot. Add the remaining whole sage leaves to the oil and fry until sage is crisp about 1 minute. Drain on paper-towel-lined plate. Toss bread cubes in skillet; heat and stir for 3 minutes or until golden brown. Drain on plate with sage. Remove and discard thyme and bay leaf. Working with a small amount of the squash mixture at a time, ladle mixture into a blender. Remove center part of blender cover to allow steam to escape. Puree the mixture. Pour mixture in original pot. Heat through on low, adding additional water until the thickness desire. Ladle soup into shallow bowls and serve with croutons and sage leaves.